I installed a Comodo Certificate on Windows Server 2012 / IIS 8.5. For most clients this certificate works without a hitch, but older Android units running Chrome and also Chrome on MacOS Sierra cannot access the site properly because the site is marked as untrusted. Basically there are two certification paths where one is requiring extra download. 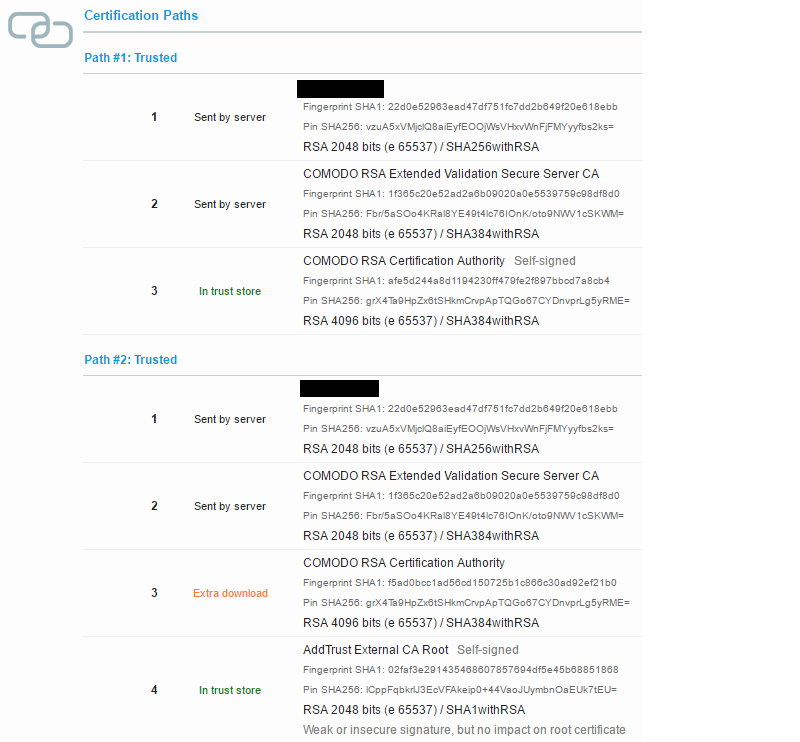 The only solution provided by the vendor of the certificate is to disable all uses of the "COMODO RSA Certification Authority", however this will only work until the next update of the trusted root certification list and requires a reboot each time. Should I get a certificate from another vendor (seems easier?) or is it possible to extract parts from the issued certificate and rebuild a proper chain? There is nothing wrong with the certificate, it has multiple chains to support obsolete browsers. (This is common with other CAs too) All you need to do is download the missing intermediate and add it to the certificate store on the server and it will serve it up for these troublesome clients. I noticed there is a SHA1 certificate in the chain. If you test your site with Firefox, you may experience the same issue. It may be seeing the SHA1 as older and not trusted. https://blog.mozilla.org/security/2014/09/23/phasing-out-certificates-with-sha-1-based-signature-algorithms/ also https://support.mozilla.org/en-US/kb/secure-website-certificate may help. SHA1 is being phased out and may be causing your issue. A similar issue happened to me today on WS2012R2 IIS8.5 on 9 out of 80 Windows VMs that were deployed from scratch using Salt automation. I fixed it by going in to IIS manager, select the web site, top-left corner 'edit bindings...'. Select the certificate, select edit. Make some changes, click ok. Click `edit bindings...' again and undo your changes and click Ok again. That resolved the issue for me. The failures showed up by running 'openssl s_client -connect :443' In the first group of lines of output you either see openssl '20', '21' and '27' errors if the issue exists and otherwise you see the correct cert chain. Not the answer you're looking for? Browse other questions tagged iis windows-server-2012-r2 ssl-certificate rsa or ask your own question. How does IE/Chrome know which Intermediate CA to use when not part of chain? Why is my SSL certificate untrusted on Android?